Brief Synopsis – A mine worker is recruited to play on a rugby team as a bruiser after a coach sees him in a bar fight. My Take on it – This is another film that I never heard of beforehand, yet chose to watch it since Richard Harris, who plays the lead here was nominated for a Best Actor Oscar for this role. The idea is an interesting one yet it just isn’t presented very well. I liked the premise that certain people can excel in one thing in life, yet constantly fail in every other aspect despite this. Harris does a fine job in the lead role and both he and Rachel Roberts got Oscar nominations among other accolades for their roles here. The biggest problem with this film is that the story itself moves along way too slowly at too many junctures which drags down the enjoyment of what they are trying to show here. I must admit that I don’t know much about the sport of Rugby, yet even after watching this, I didn’t feel any more enlightened about the sport which is a bit of a shame since one would hope that a film depicting a sport so prominently would take the time to at least try and explain the basics of the game for the unfamiliar. Bottom Line – Interesting idea that shows how someone can excel in one aspect of life yet constantly fail at others. 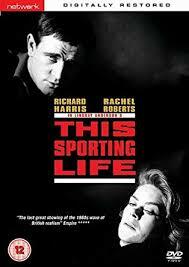 Harris does a fine job in the lead role here and both he and Rachel Roberts were Oscar nominated for their roles. The film itself moves along as a pretty tepid pace that takes away from the enjoyment since there are to many boring scenes along the way. Wis they would have explained the sport of Rugby a bit more for those unfamiliar with the sport since it is so integral to the plot of the film.